We’ve seen our first snowfall of the season, so I suppose we’d better wrap up work on this Tulip Garden quilt and let the bulbs settle in for the winter. Because I had a solid white border on this quilt, I wanted to add a little something to the edge, so I finished this one off with a flange binding. I like to sew my bindings on the front of my quilt, then hand-stitch it down on the backside, hiding the machine seamline. Normally I use a 2.25″ wide binding strip, folded in half. As usual, I sewed the strips end-to-end and pressed the binding in half lengthwise. 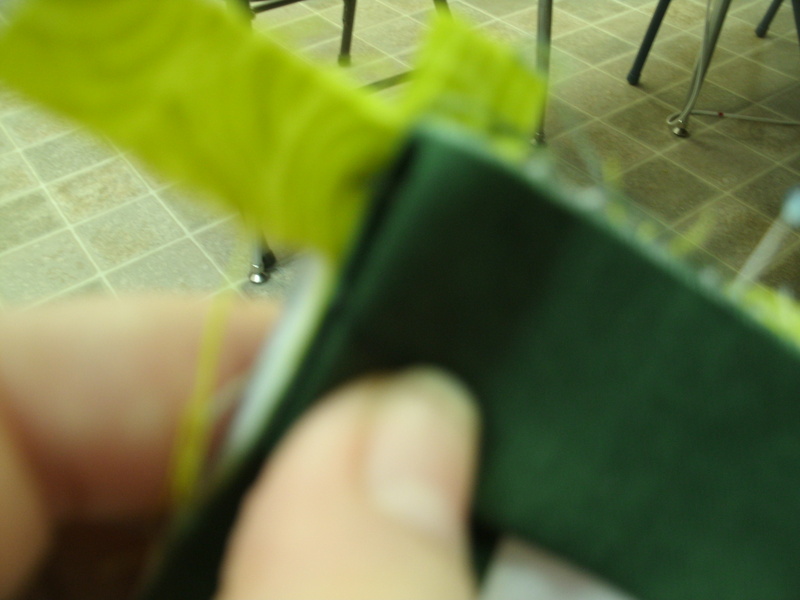 The lime green strips are cut 1″ wide. Instead of making one long strip, I trimmed or pieced them into two strips just a little longer than the length of the quilt, and two that were just a little longer than the width of the quilt. 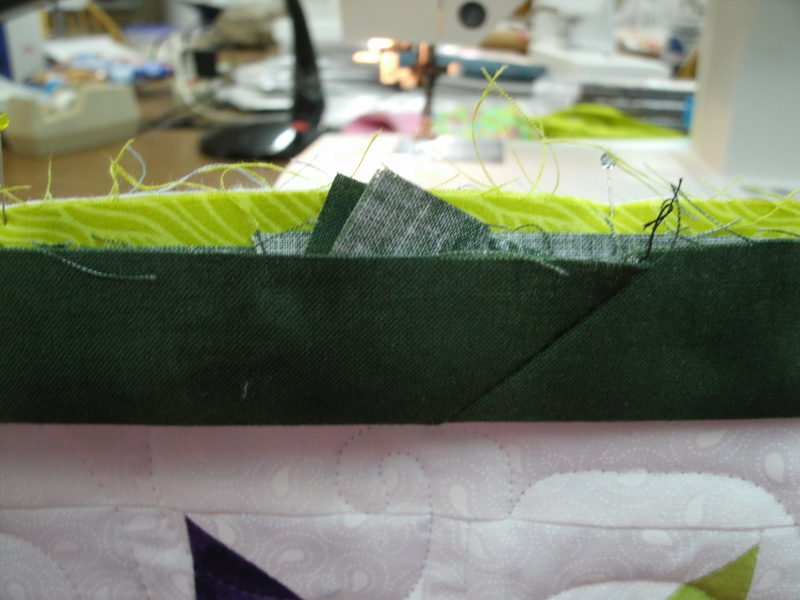 I pinned one of the light green folded strips along one side edge. 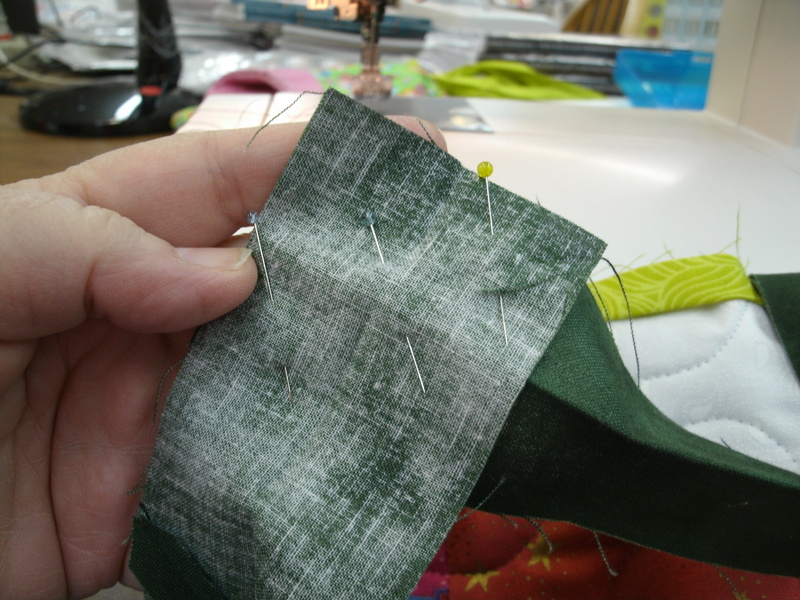 Then I started adding the dark green binding strip as I normally do. I begin about 1/3 of the way up from the bottom edge. I usually don’t need to pin my bindings before sewing, but all those raw edges to keep in line, it helped here. When I got to the corner, I had to lay in the beginning of the next lime green strip. At this point I went back and sewed the first section of binding, beginning 6-8″ from the end of the dark green strip, and ending with a back-stitch 1/4″ from the corner. Go ahead an pin the lime green strip to that second edge. Time to mitre that first dark green corner. If you’ve never done this, it’s a little tricky, but after two or three quilts’ worth, it’s a piece of cake. 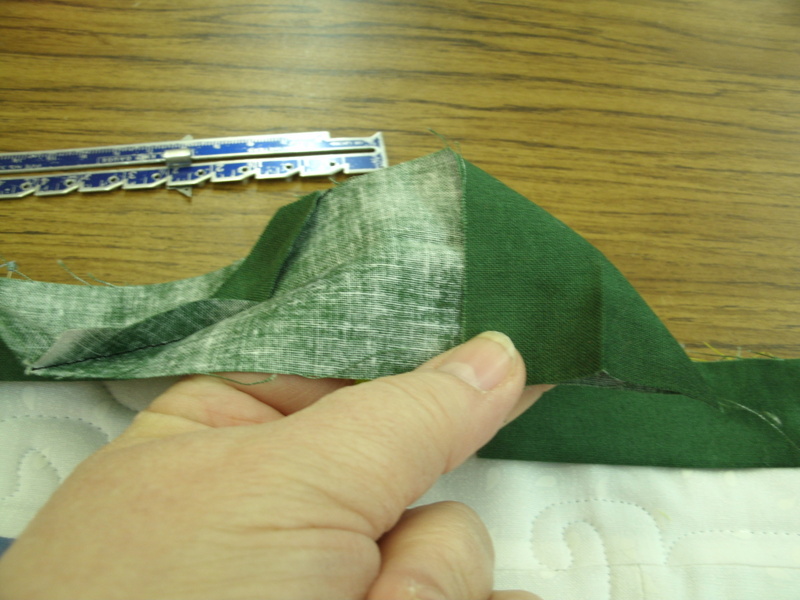 First, fold the binding strip so that you have a 45° angle. Use your thumb to hold that folded edge down so you don’t lose that angle. Now fold the binding strip back on itself. I’m sorry this shot is blurred. I was trying to get a real close-up so you can see that the fold I just made is even with the edge of the quilt (Ignore the lime green tails.). The raw edge should now line up with the second side of the quilt. Pin ‘er down and back to the machine we go. 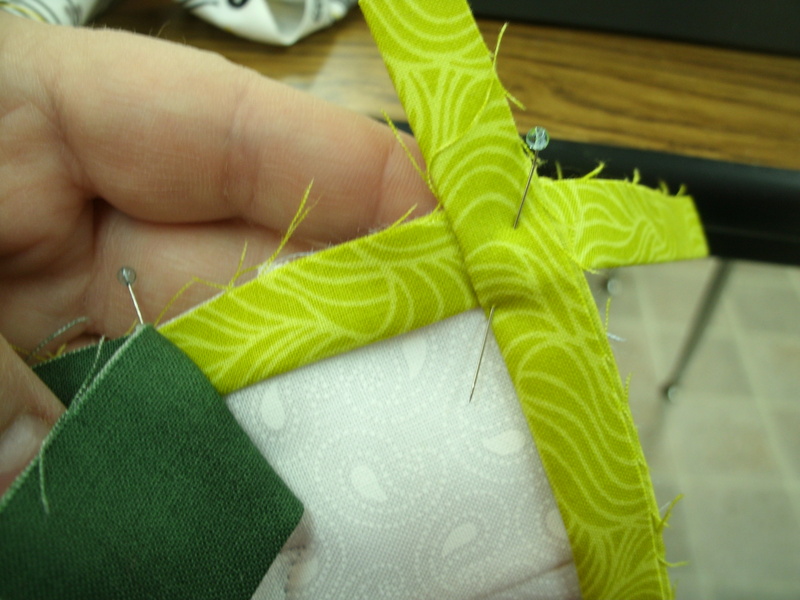 Back-stitch the beginning and sew to 1/4″ from the next corner. Repeat for all the remaining corners. When you get back around to the side you started on, stop stitching a good 10-12″ from your first stitching. Backstitch. It’s time to join those ends. This is a little tricky, too. 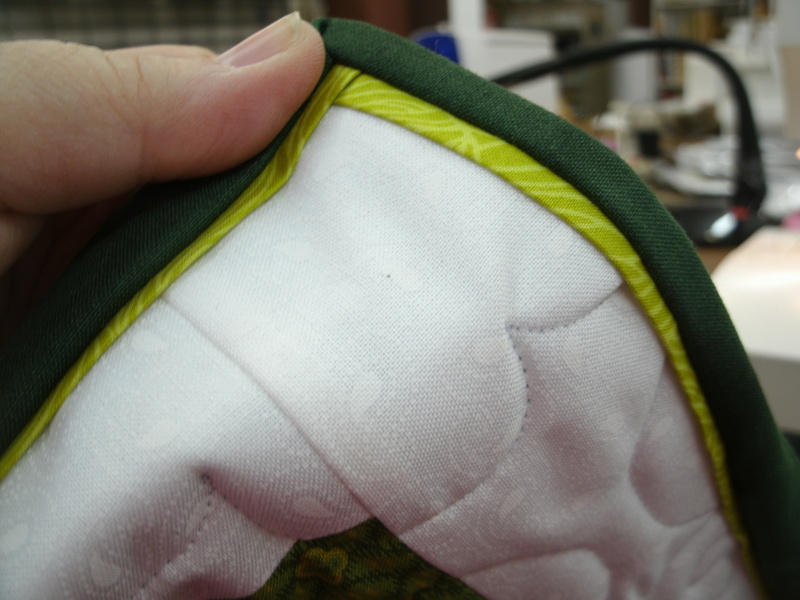 Overlap the ends of your binding…the beginning end is on the bottom. 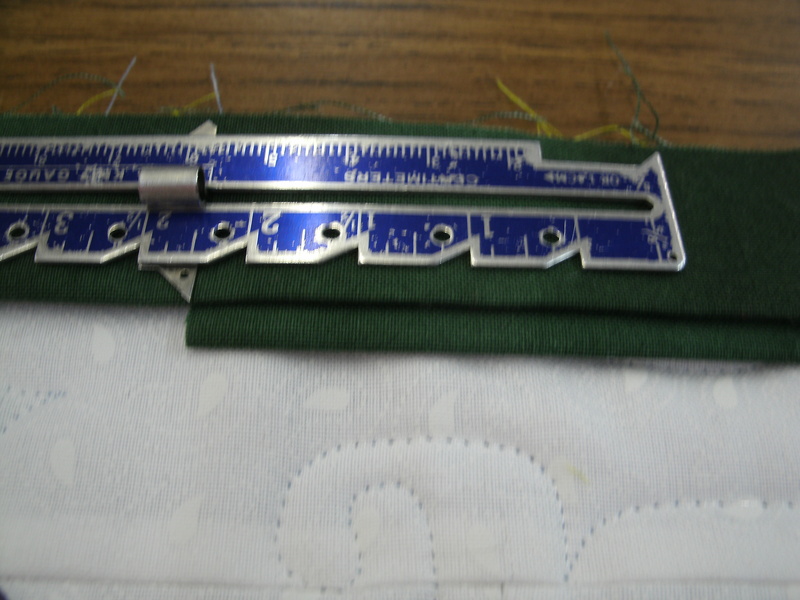 Set your seam gauge to 2.25″ (or whatever the cut width of your binding is). Lay your gauge on the binding with the marker at the end of the bottom strip and trim the top strip at the end of the ruler. Do not cut the bottom strip. Hold the end you just creased in your left hand, wrong side of the fabric facing you. Now with your right hand, pick up the other end of the binding strip, opening it out so that the right side faces you. Be careful not to twist either strip. Place the ends right-sides together, at at 90° angle to each other and pin. 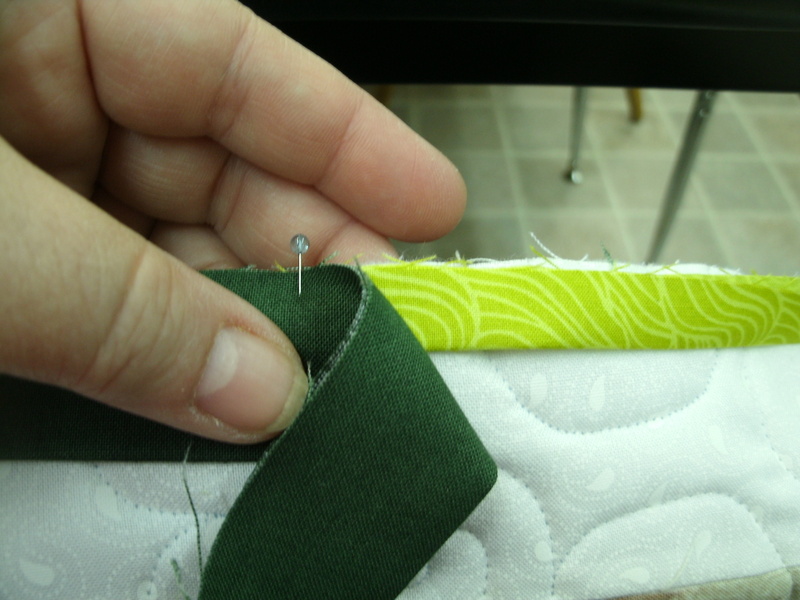 Adjust your quilt pile so that you can lay the pinned binding flat on your machine, and sew on the diagonal crease. Wait! Don’t touch those scissors yet! Once you’re sure it’s straight, go ahead and trim the excess from that seam. 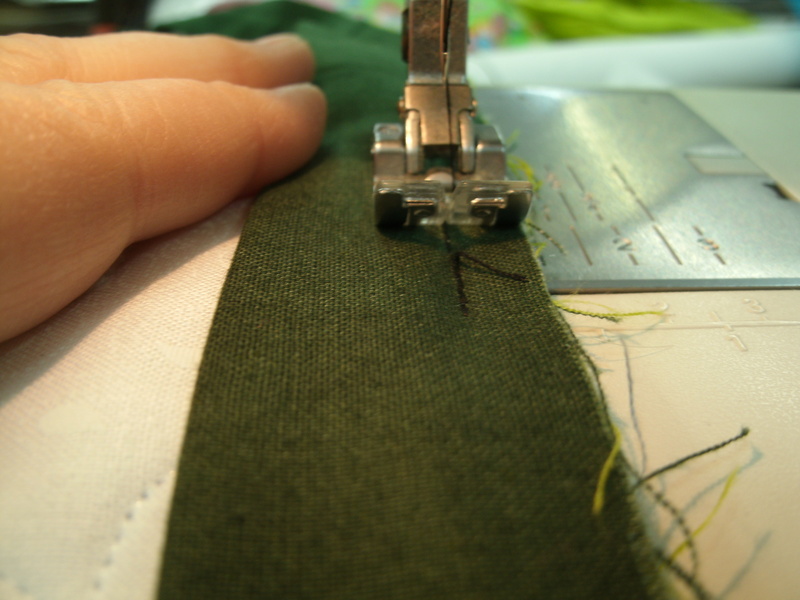 Finger-press the seam, lay the binding out flat, and finish sewing the binding down, overlapping your stitches about 1″ at the beginning and end of the seam. We’re finished with the machine work. Trim the ends of the lime green strips flush with the edge of the quilt, and clip the tips off the corners of the quilt body. 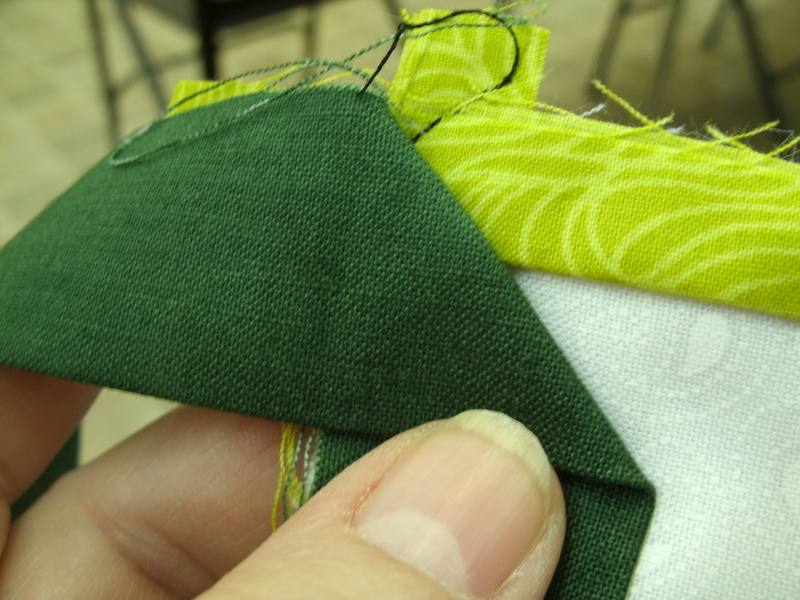 Now you can flip the dark green binding to the back of the quilt and hand-stitch down. 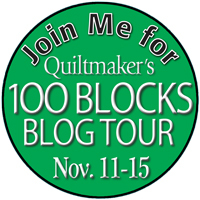 Remember, Quiltmaker Magazine’s 100 Blocks blog tour begins Monday. Check back here to see my block and a few of the patterns I have designed using it!